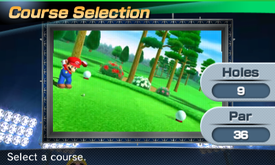 Emerald Woods is a golf course in Mario Sports Superstars. It is the first golf course in that game, with vast amounts of Fairway, few bunkers, and gently-sloped Greens. This course is the course played in the Mushroom Cup tournament. This course occasionally features rainy weather, which reduces power of hitting the ball, especially while putting. Hole 1 Par 4 338 meters The first hole of the game, features mostly fairway and some trees in between the hole. Hole 2 Par 4 350 meters A slightly longer hole than the first, featuring more trees and a less straightforward course. Hole 3 Par 3 150 meters The first Par 3 course, featuring a large amount of flat Green. Hole 4 Par 5 425 meters The first Par 5 course, a long course that players can cut through trees if they are aiming for an Eagle. Hole 5 Par 4 271 meters A shorter Par 4 course than the others. Hole 6 Par 4 358 meters This course features a sharp curve to the left and trees, with a bunker trap waiting for players who hit too far. Hole 7 Par 3 137 meters A Par 3 course that players hit the ball to a strip of Green uphill. Hole 8 Par 4 374 meters This course features a river running through it, where if players hit into the river, they receive an Out of Bounds penalty. Hole 9 Par 5 462 meters This last course is a Par 5 course, featuring thinner strips of Fairway and more trees that can get in golfers' ways. This page was last edited on June 2, 2018, at 04:42.